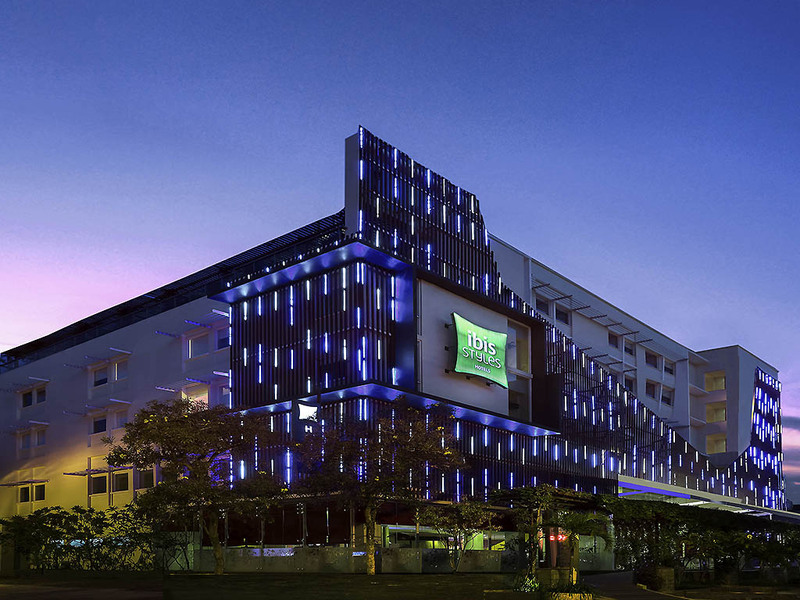 ibis Styles Yogyakarta is the right choice for leisure and business travelers looking to stay in the heart of Yogyakarta. You'll be close to the main tourist attractions. Our happy mood team can't wait to welcome you to ibis Styles Yogyakarta! ibis Styles Yogyakarta, ideally located in the heart of Yogyakarta city, is only 5 minutes walking distance from Malioboro street. Come and enjoy the thin crust pizza served in the Streats Resto, don't be cut off with our free high-speed Wi-Fi, get pampered in Seasons Spa, let your children play at Cocoon Kids Club and enjoy a cocktail on our rooftop pool bar D'Sky Bar. Ideal for your weekend getaways, an excellent option to host your family, this hotel is also suited to your business needs. Within 10 minutes or less walking distance, you will reach Tugu train station, the Beringharjo traditional market and the Sultan Palace (Keraton). Batik, art craft and bakpia centers are also accessible in 10 minutes walking distance. Taxis and pedicabs are available in front of the hotel. The hotel is 45 minutes to Prambanan temple and one hour to Borobudur temple, the Merapi mountain and also white sand beaches. Adi Sucipto international airport is only a 30-minute drive from the hotel. Providing a cool and colorful dining experience, including Indonesian favorites as well as international dishes; the buffet breakfast is available from 6AM until 10PM. Serving a range of spirits, beer, wine and cool cocktails as well as refreshments and snacks and decorated with colorful contemporary and modern art, the lobby bar is the perfect venue for a casual gathering. With a cozy atmosphere, colorful modern decoration and contemporary furniture and a view of the beautiful Yogyakarta skyline, the Sky Bar provides a perfect experience, day or night. Spent 2 nights there with my partner, we were there to celebrate my birthday. The staff were helpful and friendly and they made special notes on the day. Thank you for having us! The bathroom’s lamp was going to die, so I made a request to change the lamp. I was out during the lamp-changing and when I got back, my door was opened. Thank god nothing is missing, but please ask your employees to be more careful next time. Other than that, the service was great! I was expecting more from Ibis. One thing that I appreciate is the hospitality of the staff. Yet, the facilities still has some room for improvements. we are very enjoying stay here and all staff are friendly, and services were fast ,clean . we are appreciated to all of you. Staffs are accomodating. Faulty items in room not replaced or rectify (Hairdryer is available, but not working) lots of things inside the room r kinna rundown & requires upgrading. Poor. Attendant saw us carrying luggage and having difficulty opening the front door. Four of them kept on with their conversation without offering us any assistance. Arrived in room to see our complimentary water are opened already, and half drank. Safe in room didn't work, maybe broken? Tissue paper in toilet is few, with no spare in sight. Only one pair of slippers. This never happened in my other Accor hotel chains. In fact, among the Accor hotels that I've stayed in, I'd rate this joint the lowest. Hotel was well-located. Room was comfortable even though it was a bit small. Appreciate the attention from the hotel staff given to guests. It was a comfortable stay with friendly and helpful staff. Ibis Styles Yogya Hotel has a nice place with sky bar near the pool and the location is very close from Malioboro street. They have rooms with connecting door, that for family guest needs.